Fiscal conservatism (also economic conservatism or conservative economics) is a political-economic philosophy regarding fiscal policy and fiscal responsibility advocating low taxes, reduced government spending and minimal government debt. Free trade, deregulation of the economy, lower taxes, and privatization are the defining qualities of fiscal conservatism. Fiscal conservatism follows the same philosophical outlook of classical liberalism and economic liberalism. The term has its origins in the era of the New Deal during the 1930s as a result of the policies initiated by reform or modern liberals, when many classical liberals started calling themselves conservatives as they did not wish to be identified with what was passing for liberalism. In the United States the term liberalism has become associated with the welfare state and expanded regulatory policies created as a result of the New Deal and its offshoots from the 1930s onwards. Fiscal conservatives form one of the three legs of the traditional conservative movement in the United States, together with social conservatism and national defense conservatism. Many Americans who are classical liberals also tend to identify as libertarian, holding more socially liberal views and advocating a non-interventionist foreign policy while supporting lower taxes and less government spending. Fiscal conservatism is the economic philosophy of prudence in government spending and debt. Fiscal conservatives advocate the avoidance of deficit spending, the reduction of overall government spending and national debt, and ensuring balanced budgets. In other words, fiscal conservatives are against the government expanding beyond its means through debt, but will usually choose debt over tax increases. [I]t is to the property of the citizen, and not to the demands of the creditor of the state, that the first and original faith of civil society is pledged. The claim of the citizen is prior in time, paramount in title, superior in equity. The fortunes of individuals, whether possessed by acquisition or by descent or in virtue of a participation in the goods of some community, were no part of the creditor's security, expressed or implied ... [T]he public, whether represented by a monarch or by a senate, can pledge nothing but the public estate; and it can have no public estate except in what it derives from a just and proportioned imposition upon the citizens at large. Although all fiscal conservatives agree generally on a smaller and less expensive government there are disagreements over priorities. There are three main factions or subgroups each advocating for a particular emphasis. Deficit hawks emphasize balancing government budgets and reducing the size of government debt, viewing government debt as economically damaging and morally dubious since it passes on obligations on to future generations who have played no part in present-day tax and spending decisions. Deficit hawks are willing to consider tax increases if the additional revenue is used to reduce debt rather than increase spending. A second group put their main emphasis on tax cuts rather than spending cuts or debt reduction. Many embrace supply-side economics, arguing that as high taxes discourage economic activity and investment, tax cuts would result in economic growth leading in turn to higher government revenues. These additional government revenues, would in the long term reduce debt, they also argue for reducing taxes even if it were to lead to short term increases in the deficit. Some supply-siders have even advocated that the increases in revenue through tax cuts make drastic cuts in spending unnecessary. However, the Congressional Budget Office has consistently reported that income tax cuts increase deficits and debt and do not pay for themselves. For example, the CBO estimated that the Bush tax cuts added about $1.5 trillion to deficits and debt from 2002-2011 and would have added nearly $3 trillion to deficits and debt over the 2010-2019 decade if fully extended at all income levels. A third group makes little distinction between debt and taxes, this group emphasizes reduction in spending rather than tax policy or debt reduction. They argue that the true cost of government is the level of spending not how that spending is financed. Every dollar that the government spends is a dollar taken from American workers, regardless whether it is from debt or taxes. Taxes simply redistribute purchasing power, doing so in a particularly inefficient manner, reducing the incentives to produce or hire and borrowing simply forces businesses and investors to anticipate higher taxes later on. 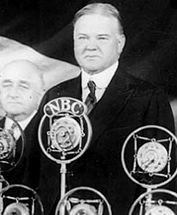 Herbert Hoover addresses a large crowd in his 1932 campaign. In the early 20th century fiscal conservatives were often at odds with progressives who desired economic reform. During the 1920s, President Calvin Coolidge's pro-business economic policies were credited for the successful period of economic growth known as the "Roaring Twenties." His actions, however, may have been due more to a sense of federalism than fiscal conservatism: Robert Sobel notes, "As Governor of Massachusetts, Coolidge supported wages and hours legislation, opposed child labor, imposed economic controls during World War I, favored safety measures in factories, and even worker representation on corporate boards." Coolidge's economic policies are often popularly contrasted with the New Deal deficit spending of Franklin D. Roosevelt, and Republican Party opposition to Roosevelt's government spending was a unifying cause for a significant caucus of Republicans through even the presidencies of Truman and Eisenhower. Barry Goldwater was a famous champion of both the socially and fiscally conservative Republicans. Reagan spent the most of any recent President, measured as annual average % GDP. Fiscal conservatism was rhetorically promoted during the presidency of Ronald Reagan (1981–1989). During Reagan's tenure, the top personal income tax bracket dropped from 70% to 28%, while payroll taxes and the effective tax rates on the lower two income quintiles increased. Real GDP growth recovered strongly after the 1982 recession, growing at an annual rate of 3.4% for the rest of his time in office. Unemployment dropped after peaking at over 10.7% percent in 1982, and inflation decreased significantly. Federal tax receipts nearly doubled from $517 billion in 1980 to $1,032 billion in 1990. Employment grew at about the same rate as population. According to a United States Department of the Treasury nonpartisan economic study, the major tax bills enacted under Reagan caused federal revenue to fall by an amount equal to roughly 1% of GDP. By the end of Reagan's second term, the national debt held by the public increased by almost 60%, and the total debt equalled $2.6 trillion. In fewer than eight years, the U.S. went from being the world's largest creditor nation to the world's largest debtor nation. In the 1992 Presidential election, Ross Perot, a successful American businessman, ran as a third-party candidate. Despite significant campaign stumbles, and the uphill struggles involved in mounting a third-party candidacy, Perot received 18.9% of the popular vote (the largest percentage of any third-party candidate in modern history), largely on the basis of his central platform plank of limited-government, balanced-budget fiscal conservatism. The Ominibus Budget Reconciliation Act of 1993 increased the average federal tax rates for the top 1%, while lowering average tax rates for the middle class. President Obama also raised tax rates for higher income persons starting in 2013, through the partial expiration of the Bush tax cuts. The Clinton and Obama tax increases lowered deficits relative to CBO policy baselines without them. While the mantle of fiscal conservatism is most commonly claimed by Republicans and libertarians, it is also claimed in some ways by many centrist or moderate Democrats who often refer to themselves as "New Democrats". Although not supportive of the wide range tax cut policies that were often enacted during the Reagan and Bush administrations, the New Democrat coalition's primary economic agenda differed from the traditional philosophy held by liberal Democrats and sided with the fiscal conservative belief that a balanced federal budget should take precedence over some spending programs. Former President Bill Clinton, who was a New Democrat and part of the somewhat fiscally conservative Third Way advocating Democratic Leadership Council, is a prime example of this as his administration along with the Democratic-majority congress of 1993 passed on a party-line vote the Omnibus Budget Reconciliation Act of 1993 which cut government spending, created a 36% individual income tax bracket, raised the top tax bracket, which encompassed the top 1.2% earning taxpayers, from 31% to 39.6%, and created a 35% income tax rate for corporations. The 1993 Budget Act also cut taxes for fifteen million low-income families and 90% of small businesses. Additionally, during the Clinton years, the PAYGO (pay-as-you-go) system originally introduced with the passing of the Budget Enforcement Act of 1990 (which required that all increases in direct spending or revenue decreases be offset by other spending decreases or revenue increases and was very popular with deficit hawks) had gone into effect, and was used regularly until the system's expiration in 2002. In the 1994 midterm elections, Republicans ran on a platform that included fiscal responsibility drafted by then-Congressman Newt Gingrich called the Contract with America, which advocated such things as balancing the budget, providing the president with a line-item veto, and welfare reform. After the elections gave the Republicans a majority in the House of Representatives, newly minted Speaker of the House Gingrich pushed aggressively for reduced government spending, which created a confrontation with the White House that climaxed in the 1995–1996 government shutdown. After Clinton's re-election in 1996, they were able to cooperate and pass the Taxpayer Relief Act of 1997, which lowered the top capital gains tax rate from 28% to 20% and the 15% rate to 10%. After this combination of tax hikes and spending reductions, the United States was able to create budget surpluses from fiscal years 1998-2001 (the first time since 1969), and the longest period of sustained economic growth in United States history. Comparison of annual federal deficits (CBO 10-year forecast from prior to inauguration vs. the actual amount), during the Obama and G.W. Bush presidencies. Bush added far more to the debt relative to the CBO 2001 forecast than Obama added relative to the CBO 2009 forecast. "To me, fiscal conservatism means balancing budgets – not running deficits that the next generation can't afford. It means improving the efficiency of delivering services by finding innovative ways to do more with less. It means cutting taxes when possible and prudent to do so, raising them overall only when necessary to balance the budget, and only in combination with spending cuts. It means when you run a surplus, you save it; you don't squander it. And most importantly, being a fiscal conservative means preparing for the inevitable economic downturns – and by all indications, we've got one coming." As a result of the expansion of the welfare state and increased regulatory policies by the Roosevelt administration beginning in the 1930s, the term liberalism in the United States today has become associated with modern rather than classical liberalism. In Western Europe, however, the expanded welfare states created after the Second World War were created by socialist or social democratic parties such as the British Labour Party rather than liberal parties. As a result, many liberal parties in Western Europe tend to adhere to classical liberalism, the Free Democratic Party in Germany being one example. The Liberal Democrats in the UK have a classical and a social liberal wing of the party. In many countries liberalism or economic liberalism is used to describe what Americans call fiscal conservatism. Fiscal conservatism in the UK was arguably most popular during the premiership of Margaret Thatcher, who, after a number of years of deficit spending under the previous Labour government, advocated spending cuts and selective tax increases to balance the budget. In 2010, as a result of the deterioration in the UK's public finances—according to fiscal conservatives caused by another spate of deficit spending under the previous Labour government, the late-2000s recession and by the European sovereign debt crisis—the Liberal Democrat-Conservative Coalition embarked on an austerity programme, featuring a combination of spending cuts and tax rises, in an attempt to halve the deficit and completely eliminate the structural deficit over the five-year parliament. In Canada, the rise of the socialist Co-operative Commonwealth Federation (CCF) pushed the Liberal Party to create and expand the welfare state before and after World War II. Fiscal conservatism in Canada is generally referred to as Blue Toryism when it is present within the Conservative Party of Canada. In Alberta, fiscal conservatism is represented by the United Conservative Party. In Ontario, fiscal conservatism is represented by the Progressive Conservative Party of Ontario. ^ Coates 2012, p. 392. ^ a b Johnston 2011, p. 210. ^ Grigsby 2004, p. 99. ^ a b c d e f Fujii 2013, p. 541. ^ a b c d e f g h i Coates 2012, p. 393. ^ Grigsby 2004, p. 100. ^ Freeman, Robert M. (1999). Correctional Organization and Management: Public Policy Challenges, Behavior, and Structure. Elsevier. p. 109. ISBN 978-0-7506-9897-9. ^ "CBO Changes in CBO's Baseline Projections Since January 2001". CBO. June 7, 2012. ^ "CBO Budget and Economic Outlook 2009–2019". CBO. Retrieved November 21, 2016. ^ a b Coates 2012, p. 394. ^ Robert Sobel (1988). "Coolidge and American Business". Calvin-Coolidge.org. Retrieved May 14, 2015. ^ Daniel J. Mitchell, Ph.D. (July 19, 1996). "The Historical Lessons of Lower Tax Rates". The Heritage Foundation. Retrieved May 22, 2007. ^ "Social Security and Medicare Tax Rates". Social Security Administration. July 10, 2007. ^ "Effective Federal Tax Rates: 1979–2001". Bureau of Economic Analysis. July 10, 2007. ^ "Gross Domestic Product". Bureau of Economic Analysis. May 31, 2007. ^ Ronald Reagan. Microsoft Corporation. 2007. Archived from the original on October 31, 2009. Retrieved July 27, 2007. ^ Office of Tax Analysis. "Revenue Effects of Major Tax Bills" (PDF). 2003, rev. Sept 2006. United States Department of the Treasury. Working Paper 81, Table 2. Archived from the original (PDF) on November 22, 2010. Retrieved November 28, 2007. ^ "Reagan Policies Gave Green Light to Red Ink". The Washington Post. June 9, 2004. Retrieved May 2, 2010. ^ Stephen Chapman (July 22, 1993). "Clinton Won't Restore Punitive Taxation-not Today". Chicago Tribune. Retrieved January 27, 2014. ^ a b Timothy Nolan (October 17, 2012). "A Brief History Of "Trickle-Down Government"". Christian Science Monitor. Retrieved January 27, 2013. ^ Steve Schifferes (January 15, 2001). "Bill Clinton's economic legacy". London: BBC News. ^ Kelly Wallace (September 27, 2000). "President Clinton announces another record budget surplus". CNN. ^ John King (May 1, 2000). "Clinton announces record payment on national debt". CNN. ^ Brooks Jackson (February 3, 2008). "The Budget and Deficit Under Clinton". FactCheck.org. ^ "Mayor Bloomberg Delivers Remarks At 2007 Conservative Party Conference". NYC.gov. September 30, 2007. ^ Fujii 2013, p. 542. ^ "Budget: Structural deficit to be balanced by 2015". Fund Strategy. June 22, 2010. Archived from the original on July 13, 2010. Retrieved November 22, 2010. ^ Wolak, Arthur (2014). The Development of Managerial Culture: A Comparative Study of Australia and Canada. Springer. p. 199. ^ Karen Kleiss (April 9, 2012). "Alberta election pits PC's 'red' versus Wildrose's 'blue' conservatives, experts say". National Post. Coates, David (2012). The Oxford Companion to American Politics, Volume 2. Oxford University Press. ISBN 0-19-976431-X. Fujii, George (2013). "Liberalism". Encyclopedia of the Cold War. Routledge. ISBN 1-135-92311-6. Lloyd, Gordon; Davenport, David (2013). The New Deal & Modern American Conservatism: A Defining Rivalry. Hoover Press. ISBN 0-817-91686-5. Grigsby, Ellen (2004). Analyzing Politics. Cengage Learning. ISBN 0-534-63077-4. Johnston, Larry (2011). Politics: An Introduction to the Modern Democratic State. University of Toronto Press. ISBN 1-4426-0533-2. Brownlee, W. Elliot. Federal taxation in America: A short history. Cambridge University Press. 1996. Kimmel, Lewis. Federal budget and fiscal policy, 1789–1958. Brookings Institution Press. 1959. Morgan, Iwan W. Deficit government: Taxing and spending in modern America. Ivan Dee. 1995. Sargent, James E. "Roosevelt's Economy Act: Fiscal conservatism and the early New Deal." Congressional Studies 7 (winter 1980): 33–51. Savage, James D. Balanced budgets & American politics. Cornell University Press. 1988.